Evil nubby pavement Disney Epcot parking lot. Above you see my best shot at trying to convey the texture of the painful surface that slowed me down in the first mile of the Buzz and Woody Best Friends 5K run this morning. In fact, as I sit here typing this in the evening, I can still feel the slight soreness on the balls of my feet as my little souvenir from that first mile. I just thought that I should post the picture of this nubby, pointy, sharp, stabbing surface first, because that was the main challenge I had in the race. But let's go back now to very early this morning as we arrived at the Epcot parking lot around 6:00 a.m. in the morning. Disney has a special bus to bring everyone over. We arrive in the dark. I'm wearing my Vibrams to walk over to the gathering area. My sister gets a snapshot of me in my Barefoot Runner's Society T-shirt. I had been observing the parking lot surface for a while, and even through my Vibrams I could feel that those nubby, sharp bumps were not going to be fun. I waited until about 6:45 and removed my Vibrams. As soon as my feet felt those sharp pointy bumps, I knew it was going to be rough going. I immediately began to worry and calculate. Should I put my Vibrams on and wait until I got into the park? How far would we be running on this? My knowledge of where we were standing and where the entrance to the park was made me realize that I was going to have to run pretty far on this surface. Interrupting these thoughts was a surprise voice from behind the rail calling to me, "Hey, Barefoot Runner's Society!" I look over and there is a guy in these huarache running sandals calling and waving to me. It turns out that it was Warren, who started a thread about running the Disney races in a forum at BRS's web site. His wife had seen the T-shirt and he had come looking for me. He told me he would be running the Goofy challenge, which is 1/2 marathon tomorrow morning and then the full marathon the next day. I have to admit that it felt really good to meet another person who knew what I was doing and expressed approval for it. This was a VERY shod race. The sea of feet around me stretched on in all directions of every kind of running shoe on the market. I did not even see any Vibrams there, although my sister told me she did see another person at one point with some Vibrams. Well, it was time to start, and there was quite a walk to the starting line, since we lined up by pacing groups and I had put myself in the 13 - 16minute group. and here is how far it was to the start line (actually was further -- it was just that at this point I thought to take picture). I bring this up because, besides the evil sharp pointy parking lot surface, this was another factor in it taking me 22 minutes to get to the first mile marker!!! When we finally got to the start line, Buzz and Woody were there chatting away. Now, anyone who's been reading along for a while knows that I don't really run for a time. I'm not a contender, and run at the back of the pack. Nevertheless, I have been happy to keep improving my own personal little best, and when I ran as Barefoot Cavewoman, I had run much better than this. This event today was a fun run and there were not going to be official times and winners. But I didn't want to be hobbling across the finish line in last place. I didn't think it would be good for the barefoot image. So, now that we were on smoother surfaces at last, I decided to concentrate on running well, and not stop to take pictures with the characters, who now had long lines forming by race contestants. All seemed to be going pretty well in mile 2 except for one thing: I had to go to the bathroom. I had been concerned that it hadn't occurred before the race. And now I wondered if I should just keep running or stop and use the rest room. I wanted to make up somehow for that first mile, and I knew that if I stopped that I was going to have to forget about making any kind of good personal barefoot showing. But, remembering how sick I got one time (and a time or two after that), when I went ahead an ran when "the call" came and it was pretty horrible. So, I stopped to use the rest room. It was a full 5-minute stop! Now, -- I will tell you -- all summer long I have not been that upset about running on the dirty sidewalks with my bare feet. I've dodged around crazy looking spots and tried not to think about the fact that the "clean" parts I'm stepping on might have God-knows-what on it. But in all my barefoot running days, I have never been as grossed out as I was walking barefoot in the rest room at Walt Disney World. (Mental note to self -- bring along a pair of paper slippers, like the kind you get in the hospital, just in case I ever have to do that again.) Sorry to bring the topic up, but it's part of gaining barefoot experience and getting better at anticipating things and protecting one's self in the future. When I came out from the rest room, I was dismayed to see that there were no longer the back-of-the-pack runners, but the walkers out there. I stepped back into the stream, and soon arrived upon the two-mile marker: 41 + minutes! Why, I practically ran an entire 5K in that time just a couple months ago. Oh, well! This is a Fun Run after all. But they turned the course suddenly and brought us on some back service roads. Darn! More rough asphalt. Not as rough and nubby and evil as the parking lot, but not nice to run on after having experienced the parking lot 20 minutes or so earlier. In a way, it was kind of nice. Because when I'm up with the runners, I usually feel like a stone in a river that is flowing up ahead of me. All the runners are usually passing me. I had a completely different perspective back with the walkers as I was the one passing all of them. It, once again, gave me the full understanding that because I have begun to run, I am ahead of the game, even if I am in last place. That is the illusion that one gets when one is a beginner. One feels in last place. But it is hard to see and understand that by being a beginner, one is ahead in many ways. Okay, so that's pretty crummy. I was running, and I had a time that some people who walked the race might have. But I really do blame it on the evil parking. lot and the fact that I had to stop to go to the bathroom. I was worried that there would be more evil parking lot at the end of the race, but -- thankfully -- it was all regular asphalt for the next .2 miles. There's some kind of official race photos, and Warren (remember Warren from Barefoot Runners Society from the start of this story?) took some photos of me at the finish line that he told me he's going to e-mail to me. So, maybe I'll post some of them when I get them. But this is it for now. I think I was 58 minutes and something at the finish line. When I told the official race photographer to get my feet in the picture, she asked if my feet were cold. I couldn't even imagine that anyone would think this weather, which was around 60 degrees, was cold. Did I stop to tell her that I thought it was really great and that my feet felt absolutely heavenly compared to 31 degrees? No, she thought I was weird enough. Why exacerbate it? To finish up, I'll leave you with a few more images of "evil parking lot." And thus ends my first barefoot running season (which I never knew was going to be a barefoot running season at all). I wonder what the next season will bring! Thanks for a great race report. I would love to come run one of the Disney races one day. That asphalt looked evil - well done for doing the mile. I often revert to my huaraches when I encounter that, but I know what you mean about keeping the barefoot image. I'm very very proud of you! Great job Francesca! I know how that kind of surface feels. There is some of that just outside my gym near my office. I'm glad its just a small area. Congratulations on your successful finish to a "season". 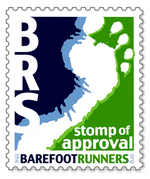 Keep up the barefooting! I'll tell you anyone native to FL would ask you if your feet were cold. Did anyone talk to you along the way?? I remember running there and the bathrooms do not surprise me. there are places I WON'T go barefoot, no way!!!! You did an awesome job, those races can be packed. Way to go!! Thank you, Bob and Robin. Staci, after this experience I definitely think I'm goig to need something like the huaraches. The thing that holds me back from getting a pair is how I've heard they are complicated to get the lacing right. Very astute, Mamaruns. I think it's possible the official race photographer was from Florida and she's one of the ones who made a comment about the "cold." Good job braving that nasty surface and the bathroom. There is a stretch of a sidewalk near my house that is very nasty. I would rather run on gravel than that surface. It really hurts especially when my feet are cold! So did you get to the laughing point of pain while running on that stuff? Way to represent! Go team barefoot! Thanks, Ewa. Yes, it would hurt more if the feet are cold. I was having trouble on the regular asphalt during the sub-30 degree runs. I'm so glad the day was not a cold one. BFJ -- I don't think I laughed, but I did have some tears in my eyes. I don't think there was a single person around me who suspected at all how much pain I was in, and I didn't want to tell anyone. It's kind of like I didn't want to admit it or something. Because, after all, I was the one who made the choice. I know you've been looking forward for many months to this race. Congrats! for getting to the start line healthy and ready to run. (That's the hard part.) And Congrats! on experiencing and savoring every mile, and reaching the finish line with a big smile. And then--when someone asked if your feet were cold (on a sixty-degree day!) --you got me laughing out loud. Thanks for bringing us along on your race, step by step. You have accomplished something terrific. You went to Disney and you ran the 5K. You did it your way. Go, Fresca! I wish you even more success in this new year. Fantastic pictures! And man does that parking lot look wicked! Yuk! Great race report and great family tradition. Go you!